the best Cocktail Mixers and Bar Ingredients! 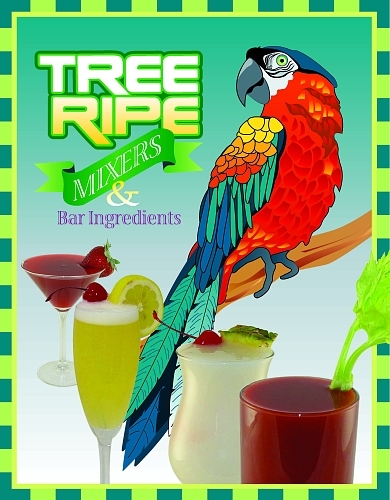 Our mixers, juices, and other bar ingredients assist you in creating a great cocktail easier and quickly! Tree-Ripe Products was established in 1965 with a mission to put you, the customer, first! Service is our most important concern as we continue to bring innovative quality products that meet our customers' needs. Our customers range from bartenders, to small and large bars and restaurants, to nationwide chains. We are more than happy to assist you with your inquiries - Contact us now to get started. Legal Disclaimer: It is the responsibility of the Internet User to read any and all disclaimers on our web site, 1800TreeRipe.com, which may be revised without notice at any time. Please note that this website is best viewed using a contemporary browser. The Tree-Ripe™ and Tree Ripe™ name & logo are trademarks of Tree-Ripe Products Inc., and the use of all material found on these web pages are prohibited without our written consent. Tree-Ripe Products Inc. shall be not responsible for any incidental or consequential damages, problems or technical malfunction of any kind, including any injury or damage to the user's or any other person's computer as a result of using this web site. All information contained within or accessed from this website are provided to the user on an "as is" basis, without warranties of any kind whatsoever. By accessing the files, graphics, and all information presented in conjunction with this web site, each user waives and releases Tree-Ripe Products Inc., and its subsidiaries, to the full extent permitted by law from any and all claims relating to the usage of site or material and information made available within. If you do not agree to the legal terms stated above please do not use this web site. Affordable web design and customized graphics by WebWiser.com (Please state Tree-Ripe referred you! ).